The pineapple (Ananas comosus) is one of the most popular tropical fruits. The name pineapple in English (or piña in Spanish) comes from the similarity of the fruit to a pinecone. 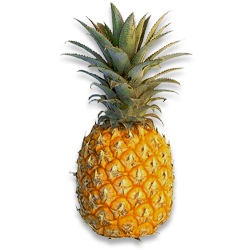 Ananas comes from anana, the Tupi word for the fruit, meaning "excellent fruit". Comosus means tufted and refers to the stem of the fruit. This fruit is native to southern Brazil and Paraguay where its wild relatives occur. Portuguese had introduced the pineapple to India and Java, and the fruit, delighted with the climate that so closely mirrored its conditions of origin, spread throughout the Far East. The Indians carried it to the West Indies before Columbus arrived. In 1493 Columbus found the fruit on the island of Guadeloupe and carried it back to Spain and it was spread around the world on sailing ships that carried it for protection against scurvy. The Spanish introduced it into the Philippines and may have taken it to Hawaii and Guam early in the 16th Century. 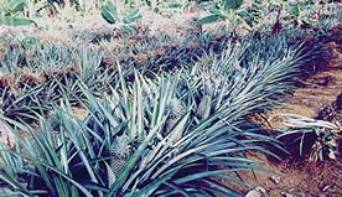 The pineapple reached England in 1660 and began to be grown in greenhouses for its fruit around 1720. The pineapple plant is a herbaceous perennial, 0.75 to 1.5 m high with a spread of 1 to 1.2 m. It is essentially a short, stout stem with a rosette of waxy, strap like leaves. The long-pointed leaves are 0.5 – 1.82 m in length, usually needle tipped and generally bearing sharp, up curved spines on the margins. They may be all green or variously striped with red, yellow or ivory down the middle or near the margins. As the stem continues to grow, it acquires at its apex a compact tuft of stiff, short leaves called the crown or top. Occasionally a plant may bear two or more heads instead of the normal one. At blooming time, the stem elongates and enlarges near the apex and puts forth an inflorescence of small purple or red flowers. 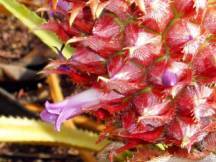 The flowers are pollinated by humming-birds, and these flowers usually develop small, hard seeds. 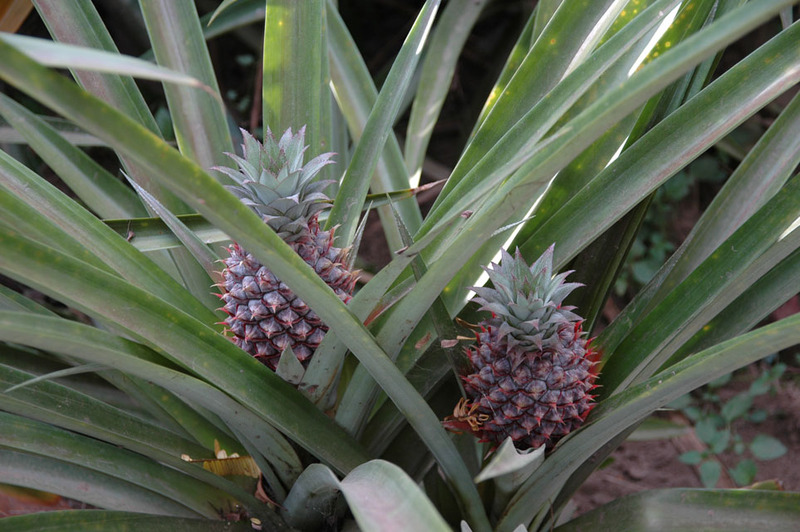 Seeds are generally not found in commercially grown pineapple. The oval to cylindrical-shaped, compound fruit develops from many small fruits fused together. It is both juicy and fleshy with the stem serving as the fibrous core. The tough, waxy rind may be dark green, yellow, orange-yellow or reddish when the fruit is ripe. The flesh ranges from nearly white to yellow. In general, the fruits are up to 30 cm long and weigh 0.5 to 4.5 kg or more. The pineapple fruit has vitamins, minerals, fibre and enzymes that are good for the digestive system and helps in maintaining ideal weight and balanced nutrition. Pineapples are a good source of vitamin C and can be eaten raw or used after cooking. Pineapple has minimal fat and sodium with no-cholesterol. Food value of pineapple is given below.